Psorias Lycomplex is a nourishing complex of antioxidants with synergistic activity, constituted by Fish Oil rich in Omega-3, Blackcurrant, Viola Tricolor, Ginger, Coenzyme Q10 and Lycopene, to help relieving the beauty problems linked to Psoriasis and of the skin general. 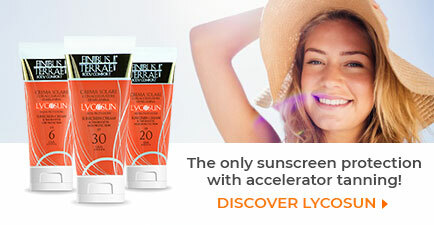 Guarantees an effective antioxidant action thanks to Lycopene which completes the formula. 1 capsule a day with a glass of water, to be taken with full stomach. 30 capsules in Pillbox, 620mg each. 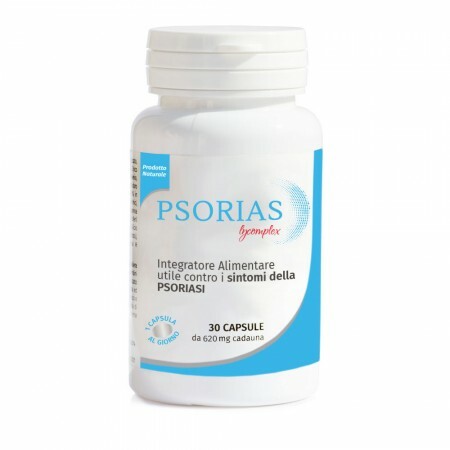 PSORIAS LYCOMPLEX is a nourishing complex of antioxidants with synergistic activity, constituted by Fish Oil rich in Omega-3, Blackcurrant, Viola Tricolor, Ginger, Coenzyme Q10 and Lycopene, helps relieving the common beauty problems associated to Psoriasis. FISH OIL rich in OMEGA-3, with anti inflammatory activity and particularly helpful with Psoriasis. Omega-3 fatty acids, specifically, are powerful inhibitors of the arachidonic acid, the main responsible for inflammation typical of Psoriasis. Therefore, a supplementation with Omega 3 gradually helps a progressive reduction of the inflammatory response and a gradual improvement of the relative problems such as itch, red patches and scaly skin. A full scientific review (Diet and Psoriasis: Part3. Role of nutritional supplements. Journal of American Academy of Dermatology, 2014) shows how the symptoms of psoriasis have been reduced in test subjects who took Omega-3 12 out of 15 times. VIOLA TRICOLOR. 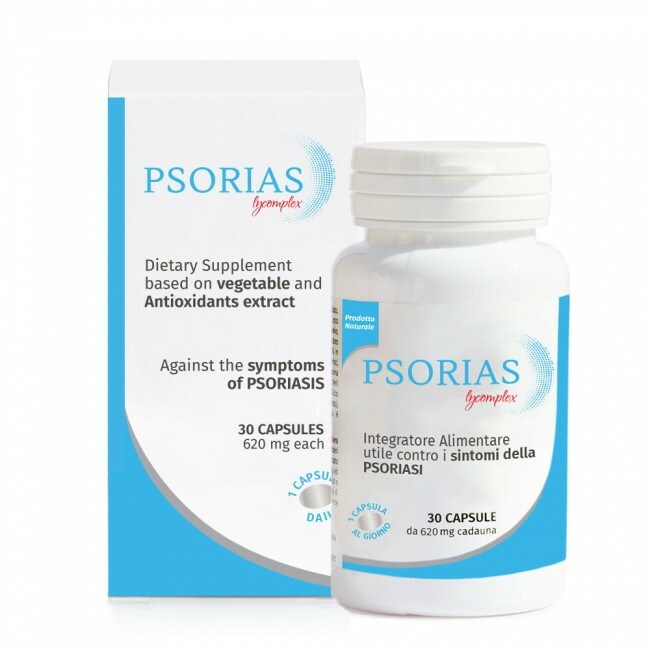 The extract, rich in flavonoids (ruthin, quercetin, violaxanthin, purple quercitrin), tannins and salicine, it’s effective in counteracting the symptoms of Psoriasis and skin problems in general, with particular benefits on irritations, red patches and plaque desquamation typical of psoriasis. BLACKCURRANT. 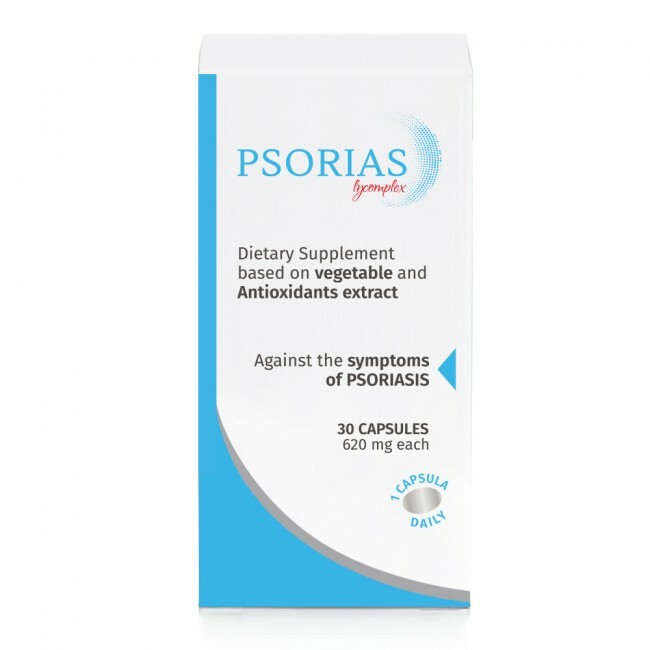 Its extract, particularly rich in flavonoids, has a pronounced anti inflammatory activity, resulting effective in reducing inflammation, itch and rheumatic pain, all symptoms which are often associated with psoriasis. GINGER. Recent studies from National Psoriasis Foundation and American National Institutes of Health show that Luteolin and Methoxy Luteolin, two flavonoids found abundantly in Ginger extract, are extremely effective in blocking the inflammatory process at early stages of the onset of psoriasis symptoms. ORGANIC LYCOPENE. 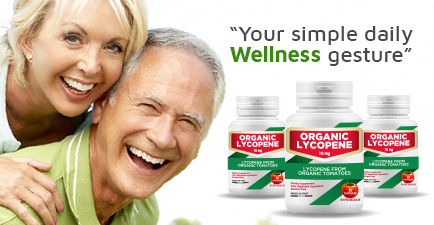 Lycopene is a nourishing and anti inflammatory antioxidant with multiple and important benefits to human health. Several studies ascertain that a daily assumption of Lycopene effectively counteracts the oxidative stress and prevents damages to the DNA, which is linked to faster ageing of the skin. COENZYME Q10. Lipid coenzyme with pronounced antioxidant activity. 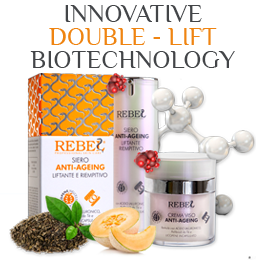 It has a beneficial role in regenerating and repairing the skin cells. It supports a better immune response. 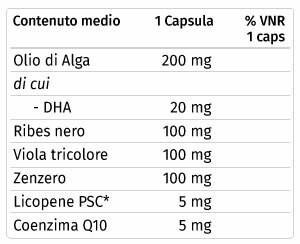 INGREDIENTS: Olio di pesce microincapsulato 12% Omega-3. Ribes Nero (Ribes Nigrum L.) foglie e.s. 1% flavonoidi. Gelatina alimentare. Viola Tricolore (Viola Tricolor L.) fiore e.s. Zenzero (Ginger Officinale Roscoe) rizoma e.s. 5% gingeroli. Pomodoro (Licopersicon Esculentum Mill.) frutto e.s. 6% Licopene. Ubidecarenone (Coenzima Q10). ECCIPIENTI: Maltodestrina da Mais. Biossido di Silicio (E551). Silice colloidale anidra Idrossipropilmetilcellulosa (E464). Amido di Mais. Caseinato. Ascorbato di Sodio (E301). Fosfato tricalcico (E341). Tocoferolo (E306). Mono e digliceridi di acidi grassi (E471). Lecitina di Soia (E322). Ascorbil palmitato (E304). Coloranti: Titanio Biossido (E171) HOW TO USE: it is recommended to take 1 capsule a day with full stomach. DOSAGE: 1 capsule a day with a glass of water, to be taken with full stomach. ADVISORY NOTICE: This product is intended for use in the context of a varied and balanced diet and a healthy lifestyle. Do not exceed the recommended daily intake. Keep away from the reach of children under 3 years old. It is not recommended to use this product during pregnancy and breastfeeding.